US Major League Baseball (MLB) and Cuba's Baseball Federation have reached a deal to let Cuban players sign with US teams despite diplomatic tensions. Eligible Cuban players can now join MLB teams without defecting from the communist-run nation, in a deal similar to those with Asian leagues. The MLB has also agreed to pay Cuba's Federation a percentage of signing bonuses that Cuban players receive. Officials say they hope the deal will end player trafficking from Cuba. Under the new agreement, Cuban baseball players over age 25, who have played in Cuban leagues for six years, are free to leave and sign with MLB teams, according to US media. If a player defects from Cuba, which traditionally produces some of the best players in the world, they will have to wait one to two years before playing for a US team. The Washington Post reported that the deal required "extensive" discussions between MLB and the Trump administration, given the US embargo against Cuba and the president's more recent rollback of Obama-era deals. Cuban players will have to obtain work visas approved by the US Department of State. The deal is in effect until 31 October, 2021. The International Chamber of Commerce will handle any disputes between the leagues. Until now, Cuban players who wanted to sign with US teams had to defect and leave the country illegally. As a result, for decades many Cuban players suffered kidnapping and extortion from traffickers - some with ties to drug cartels - on their way to the US. 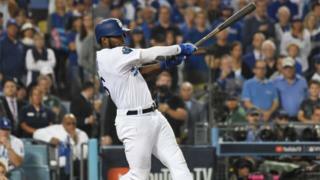 In 2014, Los Angeles Magazine revealed how Dodgers' star Yasiel Puig had been smuggled to the US in dangerous conditions and held captive by traffickers, underscoring the severity of the issue. During Fidel Castro's presidency, Cubans who defected to the US to play in the MLB were banned from ever returning. Now, players can return to Cuba in the offseason if it is approved by their MLB club. Baseball Commissioner Rob Manfred said in a statement on Wednesday that MLB "has been seeking to end the trafficking of baseball players from Cuba by criminal organisations" for years, the Associated Press reported. The deal now offers "a safe and legal alternative". And, according to AP, the agreement could spell much-needed income for the Cuban baseball federation: the most recent signing bonus for Cuban player in the MLB was nearly $1m (£792,000). Over 200 Cubans have played for Major League Baseball (MLB) teams since the 1870 - around half of them officially defected to the United States. The story of René Arocha became a renowned case in 1991. Arocha played for Cuba's national team for 10 years before defecting while in the US for a tournament. The decision meant he had to leave his wife and daughter behind in Cuba. He became a pitcher with the St Louis Cardinals, but his major league career was troubled by injuries and exhaustion. He played just one season with the Cardinals and spent the remainder of his career playing for minor league teams.